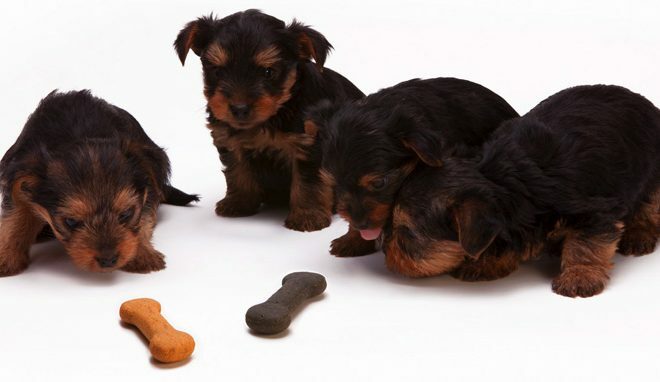 Did you know that most pets like drinking water from flowing or running sources? They never like stagnant pots and pans that most individuals often use at home. This, however, does not mean that you should leave your water faucets dripping to satisfy your pet’s water needs. 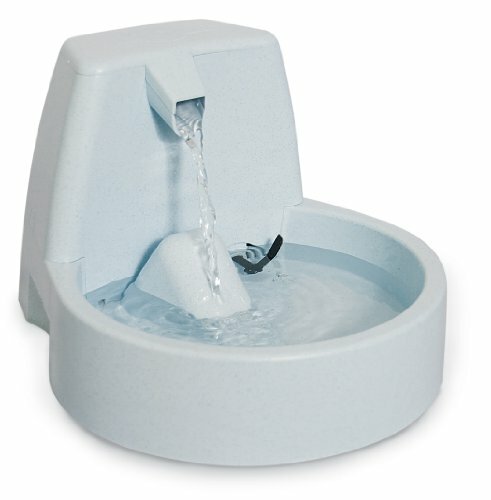 Therefore, we list down the top 10 pet fountains that are stylish and have novel systems. 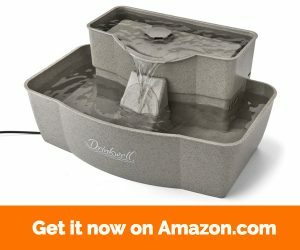 This multi-tier Drinkwell pet fountain by PetSafe is a unique 100-ounce capacity household accessory that benefits all kinds of dogs and cats. 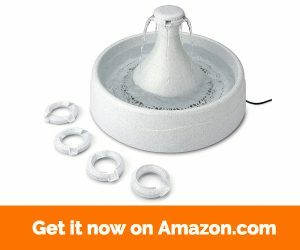 It is space-efficient, generates a free-falling stream of water that entices pets to drink, and has a replaceable carbon filter that removes odors, bad taste, and harmful microorganisms from water to keep it fresh. If you have an arthritic pet, it elevated design eases drinking. 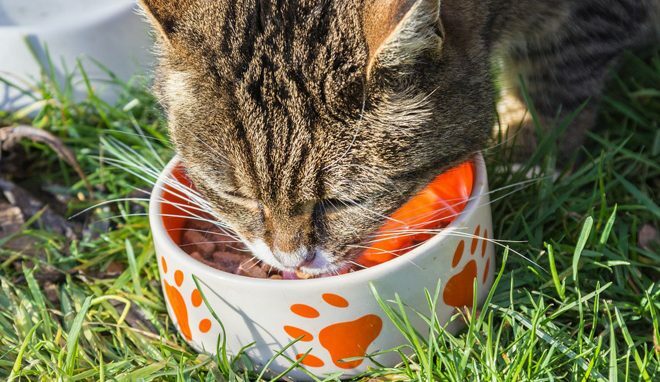 The BPA-free and dishwasher safe materials used to make it boost pet safety further, while its low-voltage pump is submersible and has a fast, quiet, and safe design that works well indoors. Manufactured using naturally BPA-free stainless steel that does not rust over time, PetSafe Drinkwell Zen is a top-grade water fountain for pets with a striking silver theme that works well in homes. 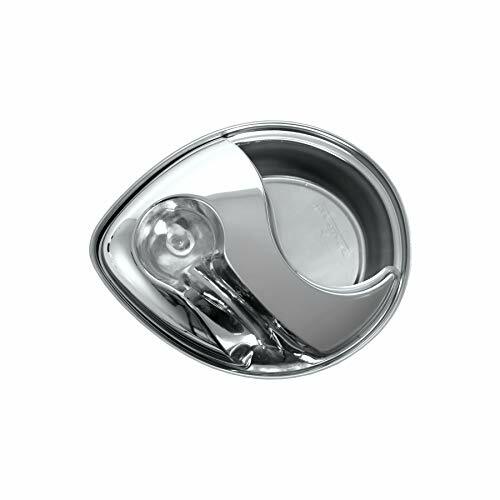 It is durable, contains 128 ounces of water at full capacity, and has a versatile and easy to use a design that benefits multi pets of all sizes. 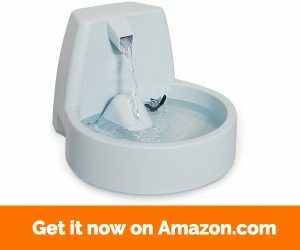 To entice pets to drink or keep water aerated, this fountain generates a wide and free-falling stream of water that pets like. The replaceable carbon filter that buyers get keeps water safe and smelling fresh, while its integrated ramp reduces splutter on floors. 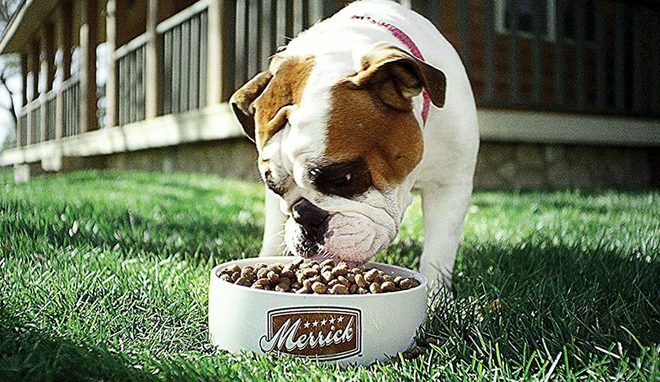 PetSafe Drinkwell Zen is dishwasher safe and is made of tough BPA-free plastic. 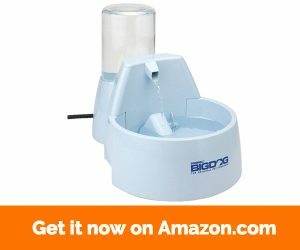 Do you have many pets that consume a lot of water on a daily basis? 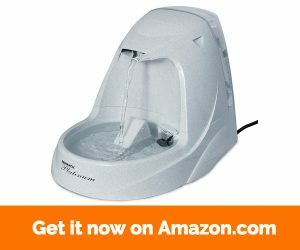 Are you shopping for a large and easy to use pet water fountain that will satisfy their needs even when you are not around? 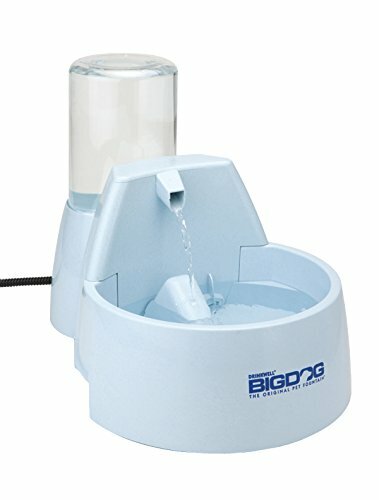 Catit Design Senses is a high-capacity three-liter fountain with a reliable water-softening cartridge that lasts long. It is durable, has a large water-air surface that maximizes oxygenation to keep water tasting fresh and healthy, and has a recirculating system that not only aerates water further but also keeps it cool. 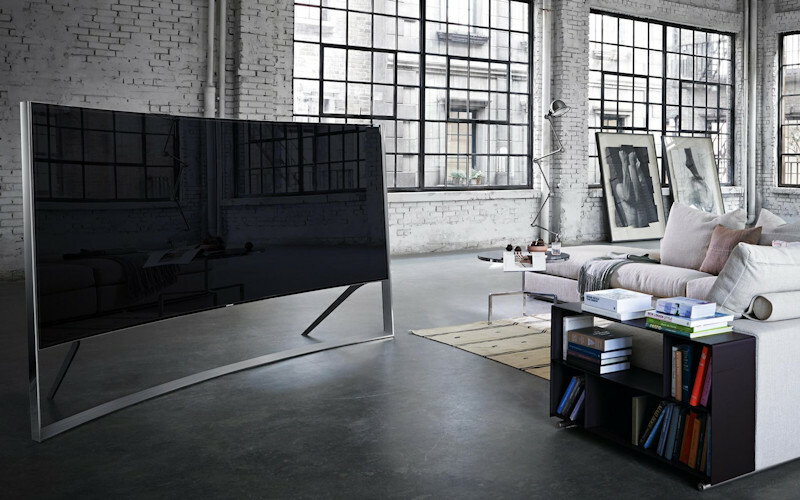 Catit Design Senses is power-efficient, retails cheap in stores, and has a safe design that works well indoors. 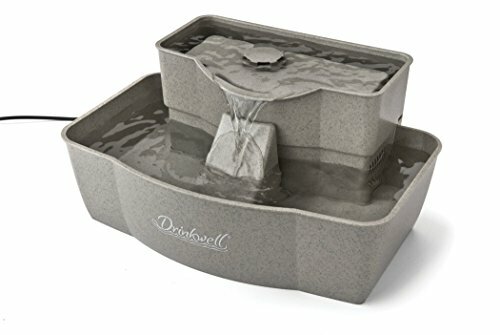 Designed for big dog breeds, Drinkwell by PetSafe is a well-made 288-ounce capacity fountain with a broad design that accommodates multiple pets. If your pet enjoys drinking from taps and other household water faucets, the free-falling stream of water that it generates will entice it to drink more every day. The replaceable carbon water filter offered keeps water clean or odor-free, while its removable reservoir eases refilling and clean up. 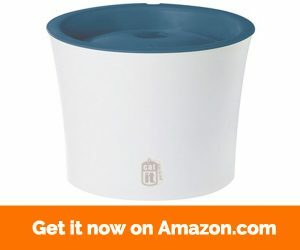 Other notable features are its durable BPA-free plastic body and anti-bite cord cover for pet safety. 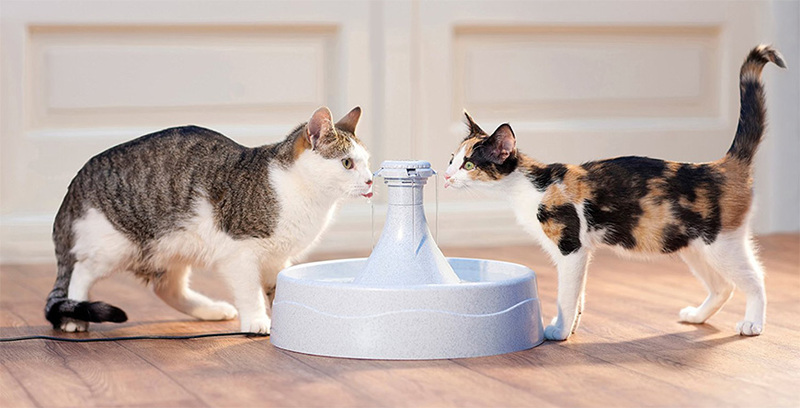 To keep pets hydrated without cluttering personal space or compromising the safety, Pioneer Pet Raindrop by Pioneer Pet is a quality drinking fountain, manufactured using high-grade ceramic material. 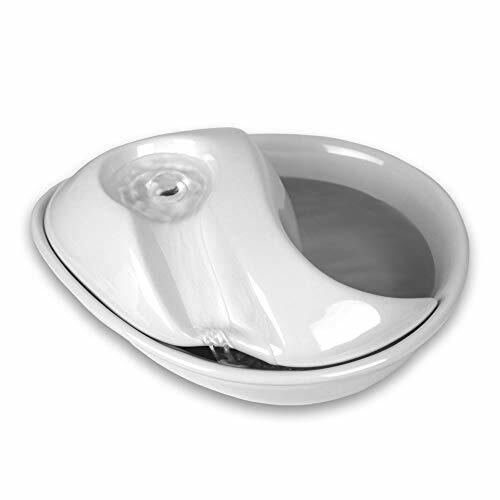 It has a striking white theme, has an auto pump that circulates water constantly to keep it fresh and well aerated, and has a convenient 60-ounce capacity that satisfies the needs pets. Installation is simple. The replaceable charcoal filter buyers get keeps water pure, clean, and healthy, while its dishwasher safe design is very easy to clean. 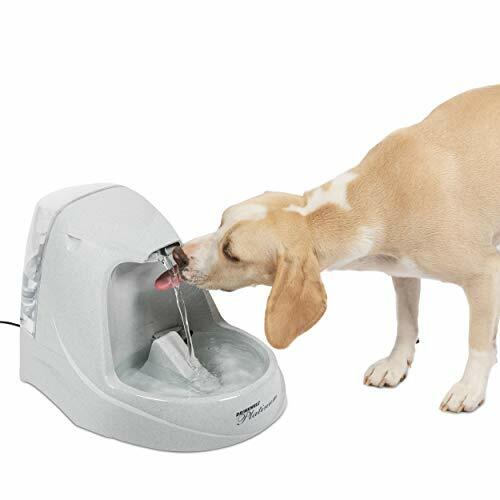 In our list of the top 10 best pet fountains reviewed in 2019, PetSafe Drinkwell 360 is a valuable high-capacity pet fountain with a compact and multi-functional design that contains up to 128 ounces of water at full capacity. 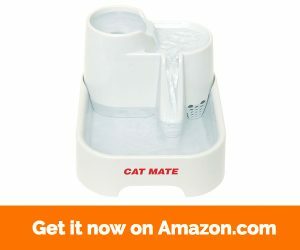 It is durable, works well for all pet sizes, and has three interchangeable water streams that you can use to entice your pet to drink. The replaceable carbon filter offered removes debris, bad odors, and harmful microorganisms from water, while its adjustable flow control feature allows you to customize its water flow on demand to match your pet’s needs. All components are dishwasher-safe, stain proof, and manufactured using durable BPA-free plastic. 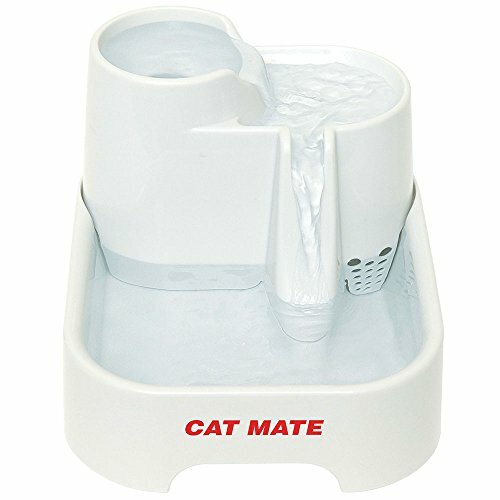 Specially designed for cats, Cat Mate is a safe and fun-to-use water fountain with impressive 70-ounce water capacity. 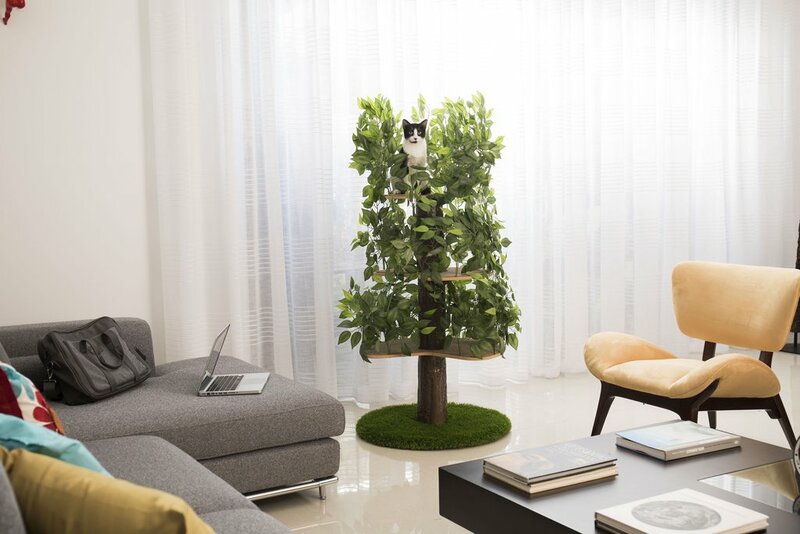 It is durable, offers multi-height drinking levels for various cat sizes, and draws its power from a low-voltage concealed power cord that measures approximately 10 feet. It also has a top-grade poly carbon water filtration and purification system that keeps water fresh and safe has a quiet pump system that is perfect for indoor use and has an easy to clean design that lasts long. 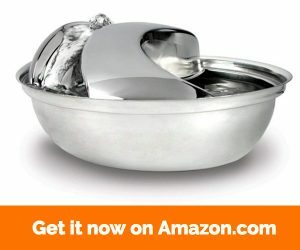 As most Pioneer pet fountains, Pioneer Pet Raindrop is a well-designed stainless steel accessory with space efficient oval design that naturally appeals to pets. 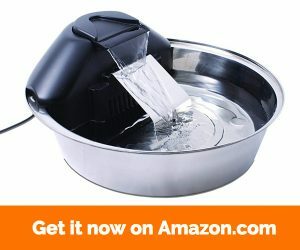 It is dishwasher-safe, has a replaceable charcoal filter that keeps water fresh and healthy, and has a patent-pending low-power pump that keeps the water well aerated. 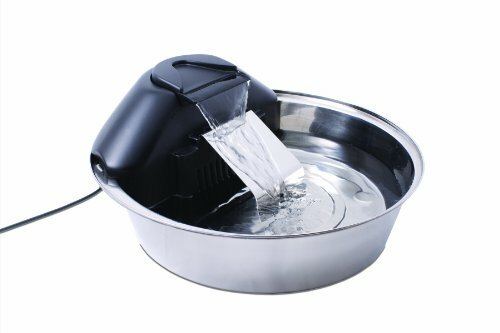 Pioneer Pet Raindrop contains up to 60 ounces of clean water. Its modern design blends well with and complements the aesthetics of décor, while its movable spout keeps water flow smoothly to lessen splutter. Even though slightly loud that comparable products, PetSafe Drinkwell Original is a feature-rich accessory that will satisfy your pets’ water consumption needs with minimal effort. 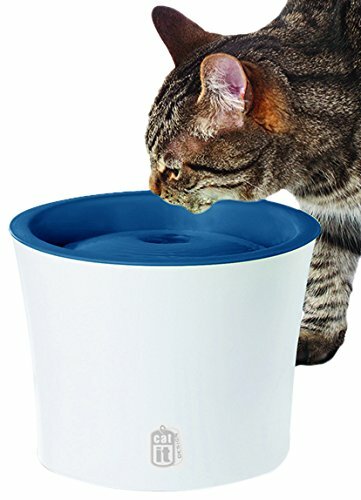 It is durable, contains up to 50 ounces of water at a time, and has a smooth, free-falling stream of water that entices cats and small dog breeds to drink to their fill. The low voltage pump it comes with a keeps power consumption low, while its removable and replaceable water filter keeps water fresh by removing all solids and bad odors that often populate stagnant water. 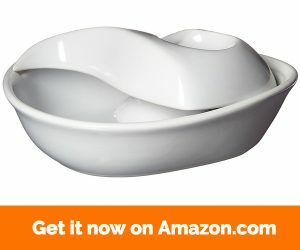 You also get adjustable water flow, BPA-free construction, and a sturdy and dishwasher safe design. 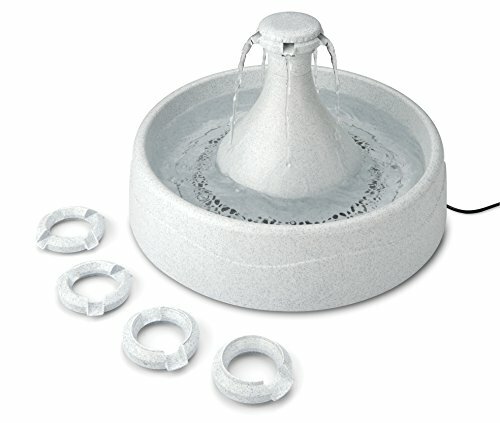 This platinum edition of the like PetSafe line of pet fountain tops our list of best. Also, it is stylish, contains up to 160 ounces of clean water, and comes with a built-in reservoir and a carbon filter that improve its functionality. Moreover, instead of predisposing your pet to debilitating kidney and urinary problems because of poor hydration, purchase an original PetSafe Drinkwell pet fountain to keep it well hydrated without predisposing it to harmful chemicals such as BPA and phthalates. Jessica is a techie at heart who loves to research and write on multiple topics including beauty, automotive and musical instruments. A Middlesex University graduate and a mother of one, she also pens baby product reviews for genericsurplus.com.Jessica has worked for the Latin edition of The Wall Street Journal and used to run a mom’s blog back in the day. When she’s not in the yoga class or writing for genericsurplus.com, you can find her chilling with her seven-year-old daughter or watching Netflix.